Beanstalk can integrate with your Sifter account, allowing you to easily manage your Sifter tickets. In order to integrate Sifter with Beanstalk, you need to enable Sifter integration within your repository. To do this, go to your Repository, then Settings → Integration → Sifter. To get started with the setup, click on Sifter icon, and then on Activate integration button inside the page. Enter your Sifter account domain and the Access Key you created in your Sifter account. 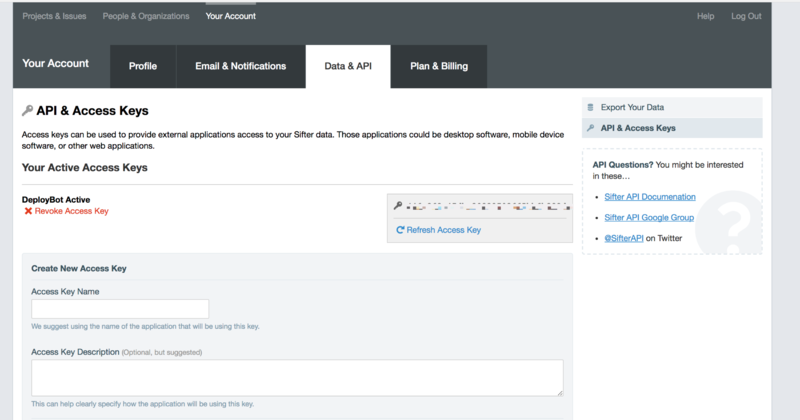 Access Keys can be created by logging into your Sifter account and going to Your Account > Connect Services > Data & API > API & Access Keys and selecting one of the keys you created. On the next step you can choose the Sifter project that will be associated with the Beanstalk repository. You can only manage one project per repository. Check and make sure everything is correct, and on the last step click Activate. You will be able to change your settings or deactivate later. The [#15] will add this commit message as a comment to ticket #15. As well, Sifter will include a link to the changeset from the comment's timestamp. # - Associated a ticket with a commit. state - Change status of the ticket. Can be either open, reopened, resolved, and closed. assign - Assign a ticket to a specific person.